In the episode, Ben and the other junior home chefs were challenged with making a breakfast dish for the judges. Ben chose Japanese-style Pancakes. His dish was well-received and spotlighted on the episode. Judge Christina Tosi commented that Ben brought an incredible amount of talent to the MasterChef Junior kitchen. Wow! So, we asked Ben to share his premiere recipe with us! 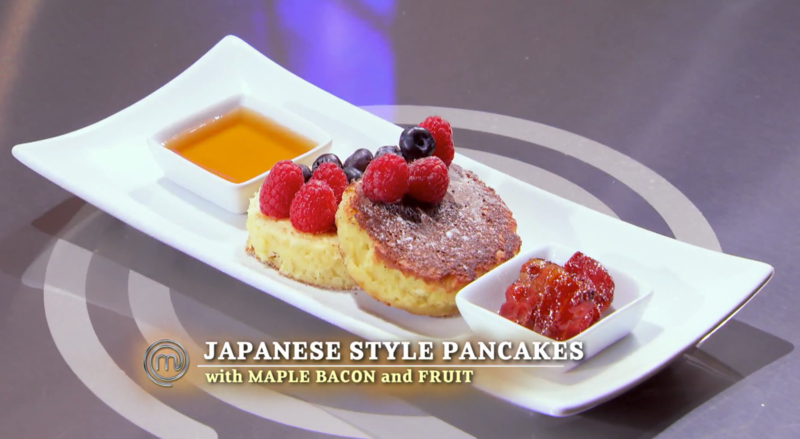 "I chose Japanese pancakes because I like the lighter texture and that they are a bit sweeter," Ben said. "In Japan, they have pancakes as a dessert. Even though they appear thick, they are airy - so you don’t get too full. I love how food looks and is presented, so I love the look of Japanese pancakes." For this recipe you will need four 3-inch-wide-by-2 1/2-inch-high ring molds. Whisk together flour, baking powder, and salt in a large bowl. Whisk together the milk, melted butter, vanilla, and egg yolk in a medium bowl until combined. Stir the wet ingredients into the dry ingredients until combined. Stir 1/3 of the beaten egg whites into the flour-milk mixture. Gently fold in the remaining egg whites until just combined. Do not overmix. Lightly spray the inside of the ring molds with nonstick cooking spray. Heat a large nonstick skillet over medium-low heat. Coat with nonstick cooking spray. Put the prepared ring molds in the middle of the skillet and fill each with 1/2 cup of batter (it should fill each ring mold about halfway). Cover the skillet with the lid and cook until the batter rises to the top of the ring molds and is golden on the bottom, about 5 minutes. Release the bottom of the pancakes with a spatula. Grasp the sides of the ring molds with tongs to stabilize them and then carefully flip. Cover and cook until golden on the other side, about 5 minutes more. Transfer to a plate and remove the mold. Sprinkle powdered sugar on top. Serve with butter and maple syrup. The pancakes should be eaten before they deflate. Lightly spray the ring molds and coat the skillet again with nonstick cooking spray, and repeat the cooking method with the remaining batter.